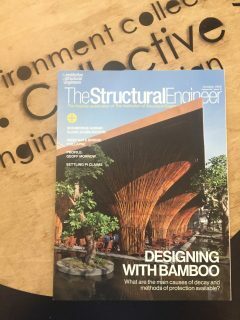 Those with access to the Institute of Structural Engineers’ (ISE) primary publication; The Structural Engineer, have been treated to a 5 part feature series which aims to summarise current knowledge and best practice on the structural use of bamboo. The in-depth technical articles will be covering bamboo introductory information, durability and preservation, design values, element design equations, and connections. The BEC Team have just finished with Octobers’ edition, which covered the various bugs, fungi and termite attacks to which bamboo is particularly prone. Keeping bamboo off the ground and dry appears to be the best way to preserve it pre-installation, and once installed treatment with boron (for internal applications) or modern copper based wood preservatives (for exterior applications) are the best methods of preventing damage and decay. Those interested can purchase the magazine online here, otherwise swing by our office for a coffee and take a peek at ours!